LESLIE'S WEEK is honored to be recognized by some of the most prestigious organizations in the world. GuideStar is a 501(c)(3) nonprofit organization, EIN 54-1774039. Our mission is to revolutionize philanthropy by providing information that advances transparency, enables users to make better decisions, and encourages charitable giving. LESLIE’S WEEK is the recipient of a Medline Grant for innovative practices in the area of Stage 4 Breast Cancer by supporting terminal breast cancer women and their families with pioneering programs in their vacations away from cancer so they may Make Memories that Outlast Cancer! Medline is a global manufacturer and distributor serving the healthcare industry with medical supplies and clinical solutions that help customers achieve both clinical and financial success. Headquartered in Northfield, Ill., the company offers 550,000+ medical devices and support services through more than 1,600 sales representatives who are points of contact for customers across the continuum of care. BREAST CANCER WELLNESS MAGAZINE SELECTED LESLIE'S WEEK AS THEIR 2017 "BREAST CANCER NONPROFIT OF THE YEAR"
"I am delighted to inform you that you have been selected as an honoree of the one hundred in 2015. Created and supported by Mass General Cancer Center, each year we honor 100 Everyday Amazing individuals and groups whose commitment to the fight against cancer inspires us all to take action. Congratulations on your selection by a dedicated committee of prior honorees, clinicians and scientists from Mass General and partnering institutions; cancer advocates and supporters. Selection as an honoree of the one hundred is one of the highest forms of recognition awarded by our Cancer Center." 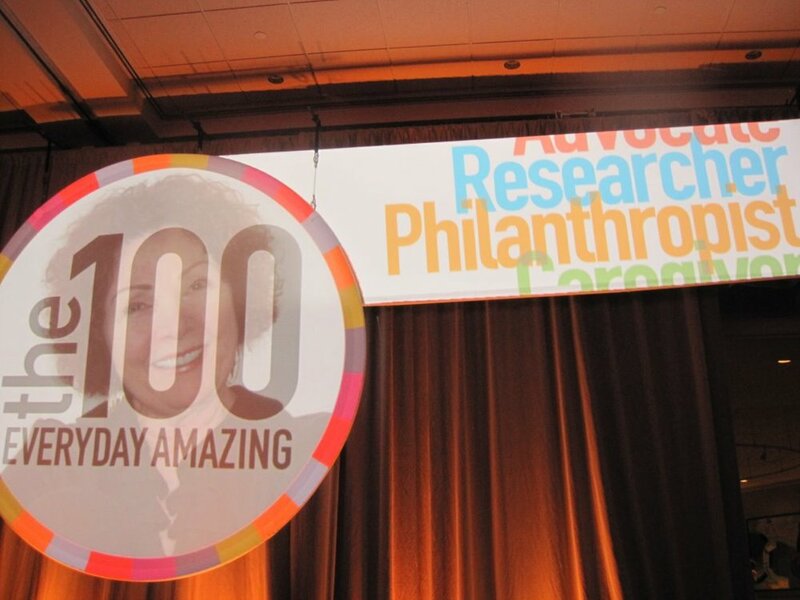 The 100 "Everyday Amazing Individuals and Groups" event where LESLIE'S WEEK was an honoree. The Anne Arundel Medical Center, Geaton & Jo Ann DeCesaris Cancer Institute "Living Life in Full Bloom: National Cancer Survivors Day" was held on June 1, 2014. LESLIE'S WEEK was invited to attend and manage an exhibitor booth. We expected to be introduced for what was described as a 3 minute presentation at the end of the conference. Ani Chang and I were prepared for our 3 minutes. The 2014 Fire & Soul Award was presented to LESLIE'S WEEK founder, Sandra Gunn, by Cathy Copertino, Executive Director, AAMC Geaton and Jo Ann DeCesaris Cancer Institute. We were Stunned and Amazed! "For the courage to look beyond oneself to bring joy to others." "I long to accomplish great and noble tasks, but it is my chief duty to accomplish humble tasks as though they were great and noble."